If you’ve always loved a birthday filled with balloons, then you might enjoy this twist to the common balloon. Instead of just hanging there for no real reason besides decoration, you could give them purpose. 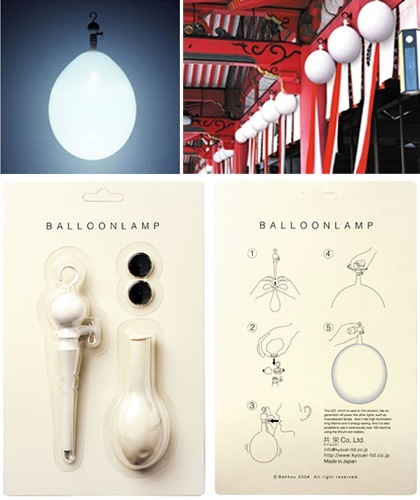 This balloon has an LED light placed inside of it. Giving a soft lighting effect perfect for backyard parties and other random events. Of course it’s entirely possible you could attempt to do something like this yourself at home, but at least with this lamp you receive a handy little hook on the end of the light. The hook allows for it to be hung on just about anything. It doesn’t really say how the blowing up of the balloon works and how it stays secure. Plus the manual itself is in Japanese, but luckily there are some pictures to go with it. In order to keep the LED illuminated, it uses 2 lithium-ion watch batteries that will allow it to shine for 100 hours. That batteries are actually included this time. Although I’m not sure how much that will help people since one of these will cost you $63 from the Japan Trend Shop.